The Dragon Quest series has had an odd relationship with western gamers. It’s a bonafide cultural icon in its home country of Japan in a way few games have managed to become anywhere. I mean, as I type this review, I can hear the theme being played by a school band at the local elementary school, and that’s hardly a rare occurrence. However, it’s never quite taken in the west, and it’s certainly not for lack of trying. Nintendo gave the first game a massive push, overhauling the graphics, interface, and save system, and featuring it prominently in their magazine Nintendo Power, only to be left with so many unsold cartridges they ended up giving them away with subscriptions. Enix of America quietly translated and released the other three NES games, then disappeared shortly into the 16-bit generation before they could release Dragon Quest 5 and 6. Enix of America then briefly reappeared in the PlayStation 1 era, translating the massive Dragon Quest 7. Unfortunately, that game was about as pretty as the south end of a northbound mule, and it released almost a year after the PlayStation 2 released, so it wasn’t exactly a big hit. After Square and Enix merged, the company clearly decided they wanted to make a strong effort to establish Dragon Quest outside of Japan with the release of Dragon Quest 8. 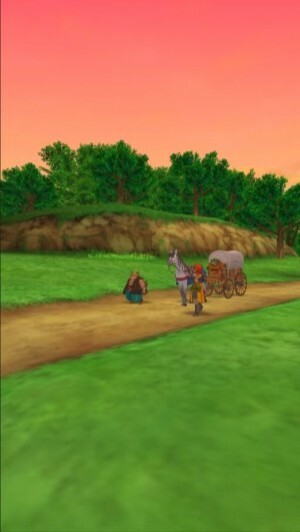 It helped that the Japanese version was already a gorgeous game, in sharp contrast to Dragon Quest 7. The publisher went the extra mile for the English release, adding excellent voice acting, extra animations, an overhauled menu system, and an orchestrated version of the soundtrack. This game was also the first release of the main series in Europe. Just for extra mustard, Square Enix packed in a demo disc for Final Fantasy XII. The game ended up a critical and commercial hit, and it finally seemed like Dragon Quest was overseas to stay. In the next few years, Square Enix would translate several spin-offs and remakes, releasing almost every game without fail. Perhaps they went to the paint a bit too hard, though, since by the time Dragon Quest 5 DS released, sales had greatly tapered off. Square Enix took a step back from English releases, handed the car keys to Nintendo (who also seem to have cooled on localizations), and wouldn’t handle Dragon Quest again themselves outside Japan until, well, today. It seems the series is getting another chance with the English release of the iOS version of Dragon Quest 8 ($19.99). Unfortunately, there doesn’t seem to be nearly as much gusto behind this game as there was last time, and the results might be a little underwhelming for English fans. Let’s talk about the game itself, first, though. While other RPG series had reduced their scope and backed away from world-spanning adventures across open environments due to the rise in costs of realizing such an ambition, Dragon Quest 8 represented the full, glorious 3D realization of the JRPG in its purest form. It has big towns and cities filled with NPCs who give you vague advice and don’t care if you steal stuff out of their dresser and a huge, treasure-packed overworld map that’s in scale with your character’s dimensions. It has cool forms of transportation, dungeons with branching paths that lead to treasures for some reason. There are animated 3D battles with a menagerie of interesting creatures, epic boss fights, and a twisty story with lots of memorable vignettes. You can gamble in casinos, create a monster team to battle in a coliseum, hunt unique monsters, and craft a veritable arsenal of weapons and armor. You’ll travel the seas, fly through the air, fight evil wizards and dragons, and save the world through the power of friendship and love. It’s a wonderful, charming game that any fan of JRPGs will find something to love about. You play as the nameless hero, as he travels with his companions trying to lift the curse that has befallen his kingdom. As usual for a Dragon Quest game, on the way to reaching your goal, you’ll end up mixed up in a whole bunch of other situations along the way. Some of these side-stories end happily, others not so much, but they’re all quite interesting. One of the reasons why I love this series is its bittersweet nature. Sometimes you’re too late to save the day, and all you can do is help people find closure. Sometimes, you can’t even do that, and you’re left to just reflect on what happened. A cursory glance at Square Enix’s two main franchises would probably have you peg Dragon Quest as the more childish series, but there’s actually a sort of maturity to the storytelling that you rarely see in games. 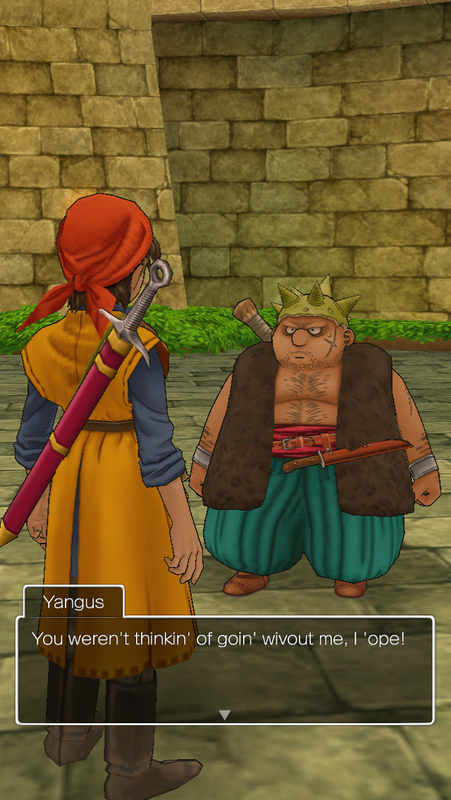 More unusual for the series, the party members in Dragon Quest 8 are quite fleshed-out and very memorable. The boisterous thief Yangus is the clear star of the show, and his constant feuding with King Trode is genuinely laugh-out-loud funny at times. Jessica’s slightly spoiled yet kind-hearted personality and Angelo’s pompous self-adoration round out the main cast nicely. Even the mute hero gets quite the backstory, though you have to go digging into the post-game to unveil it completely. There are lots of other memorable characters you’ll meet along the way, including the awful Prince Charmles, the colorful (in more ways than one) Morrie, and the mysterious thief Red. Dragon Quest is well-known for being a very orthodox JRPG series, and its battles reflect that more than anything else. The encounters are invisible and random, and the battles are the stereotypical turn-based affairs associated with the genre. The only new thing Dragon Quest 8 added was the tension meter, which allows you to use a character’s turn to charge up for a powerful attack. Tension actually makes this one of the easier Dragon Quest games, but you still have to remember to use buffs and debuffs to your advantage if you want the sailing to be smooth. They’re very important in this series, and people ignoring them is what tends to lead to the mistaken notion that you have to grind in these games to win. 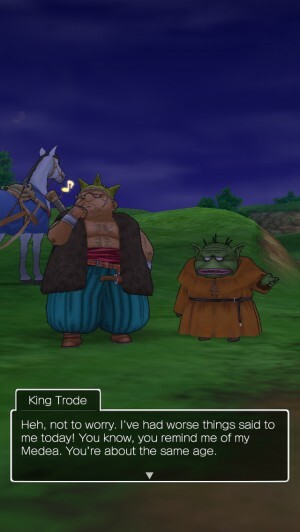 Unlike the preceding and following installments, there isn’t a job class system in Dragon Quest 8. Instead, when you level up, you get points that you can put towards any of five different categories. When a certain number of points are put into each category, your character will learn a new skill or ability. If it’s your first time playing, my advice is to pick one or two categories and lean into them hard. While I miss the great customization the class system offers, the skill system still offers quite a bit of flexibility while making for a more balanced experience. It’s almost impossible to screw yourself over by developing your character the wrong way, since there really is no wrong way to develop. All told, the game’s main quest will take the average player 60-70 hours to finish, and the side content and post-game will easily drive that to the 90-100 hour mark. The pacing gets a bit spotty in the middle, but for the most part, you’ll be so absorbed that you won’t notice the hours go by. The main quest takes the form of a road trip that helps keep things moving, while the focus on smaller side-stories means you can take the game in digestible bites if that’s your speed. If you step away and forget what you were doing, you can talk to your party members. They’ll bring you up to speed and make some amusing comments, to boot. As for the iOS port, it’s not quite as good as you might hope. Since this is just a translated version of the Japanese release, the orchestrated music and voice acting found only in the western PS2 release are out. The orchestrated music, I can live without, since it was recorded at low quality and bloated the game’s loading times, but losing the voice acting hurts. Reading Yangus say “Cor Blimey!" just isn’t the same as hearing it, and some of the jokes have a lot less punch in text, like the gags around Prince Charmles’ name. Tailored for the train-faring Japanese population the game is played in portrait mode, which is going to seem like an odd choice for some people. I actually like being able to play one-handed, but there’s no doubt the lack of horizontal space cuts down on the feeling of grandness in some of the game’s environments. The controls themselves take a little getting used to, but after an adjustment period, I didn’t have any problems with them. It’s certainly a unique interface, but it ends up working out fine. The game only supports hardware with A5 chipsets or higher, but realistically, you really should have an A6 if you want to play without problems. This is a heinously inefficient port, suffering from framerate issues even on an iPhone 5S, so playing it on a 4S and its contemporaries is basically asking for trouble. Loading times are on par with the PS2 release, but not as well-hidden due to the loading screens. Apart from framerate problems, technical issues were minimal on the 5S, but it’s apparently crash-prone on A5 devices. Dragon Quest 8 is a beautiful game, don’t get me wrong, but there’s really no reason modern mobile hardware should be struggling with it at all. Oh, and just to settle any fears you might have, there’s no online connection required and Square Enix hasn’t messed with the game at all, so there are no IAPs, either. Although the loss of the voice acting and slightly more cramped view make for a lesser experience than the PS2 original, this is still an absolutely incredible game, provided you have the hardware to run it. Up until now, Square Enix has been content to deliver ports of their NES and SNES games, along with the odd DS game. This, however, is one of the genre kings of the PS2 generation, and as such, it feels like a much bigger and more advanced experience than virtually anything else available on the App Store. This is one of those games like Star Wars: Knights of the Old Republic ($9.99), where it feels absolutely amazing to be playing this on my mobile device. Sure, it’s expensive, but if any game could justify a higher price tag, Dragon Quest 8 is it. I acknowledge this is a very long review, so for those of you who gave up and skipped down to the bottom, here’s the short version. 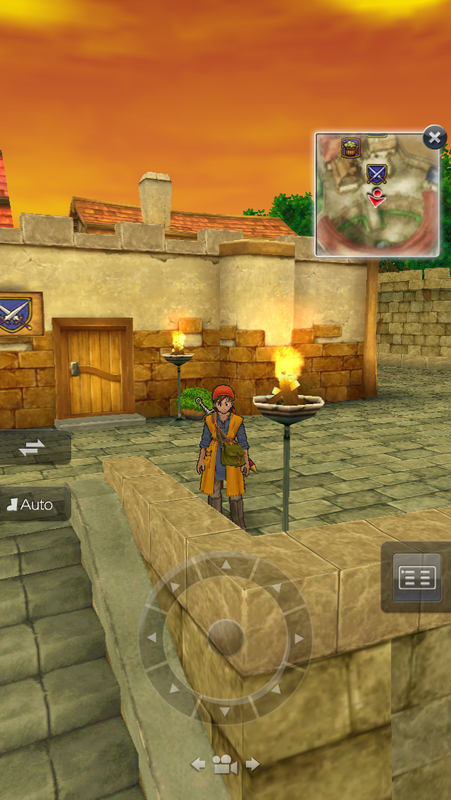 Dragon Quest 8 on iOS isn’t quite up to the original English PS2 game, thanks to a lack of voice acting and some technical issues, but it is a largely faithful version of one of the best RPGs of the last decade. It’s a grand adventure that no JRPG fan should miss, as long as your device can run it. Here’s hoping this return is a successful one.